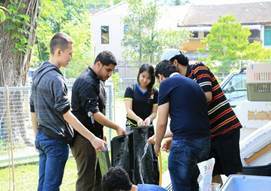 More than 25 School of Foundation (SOF) students from the Asia Pacific University of Technology & Innovation were involved in an animal welfare and care learning programme at the new, animal friendly, and welcoming surroundings at the SPCA premises in Ampang. This is a continuing volunteer programme that began in January 2016 and will continue throughout this year. Organised by SOF, the objective is about giving back to society as well understanding animal behaviour and care. Caring for animals is not something that most of the students are used to. Therefore it was only natural that there was some anxiety followed by enthusiasm and by the time the day was over, the smiles and elation on the faces of the Foundation students said it all. Our volunteers first attended a short education programme and then had the opportunity to practice some of the skills learnt like taking the dogs for walks, cleaning up kennels and the surroundings, feeding animals. 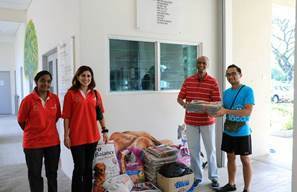 As a gesture of appreciation to the SPCA, Dr Sarvinder Kaur (SOF Head of School), Ms Abhhirami, and Mr Vijay Reddy (Senior Manager, Special Projects) presented pet food well as old newspapers which the SPCA so desperately needs for its use. Students of the SOF deserve to be applauded for contributing to a noble cause. The dedicated and tireless efforts of the staff and volunteers of SPCA must be commended. SPCA Selangor is an animal welfare organisation based in Ampang Jaya, Selangor. The aim of the SPCA is to protect defenseless animals and to alleviate their suffering. In addition, SPCA provides an adoption program, investigation of cruelty reports, humane education, assistance to community animal caregivers and run a dedicated, low-cost spay/ neuter clinic.